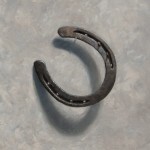 Here I go again with another horseshoe painting… This is actually the same exact horseshoe I used for my last horseshoe painting. It came from a horse named Aristocrat but you can read about him in my last post. I have really come to appreciate the two remaining nails that are hanging out on the right side of the shoe. Although it was the same horseshoe I choose to use a distinctly different pose and lighting to the setup. 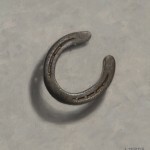 In fact this pose marks a slight departure from all the tool portraits, fishing lures, and horse tack I’ve painted in this continuing single item still life series. How so? Well, each item I paint always hangs from a single nail or hangs in between a pair of nails. For the placement of this horseshoe I managed to make the horseshoe balance on top of the nail. I was able to balance the horseshoe on top of the nail only by allowing enough of a lean towards the wall. The friction against the wall kept it from falling off, although any sudden movements and this thing was ready to come crashing to the floor! You’ll notice that there is a slight lean to the horseshoe’s pose. It leans slightly to the right on purpose. I tried having the horseshoe pointing straight up and it just seemed a little too boring and predictable. 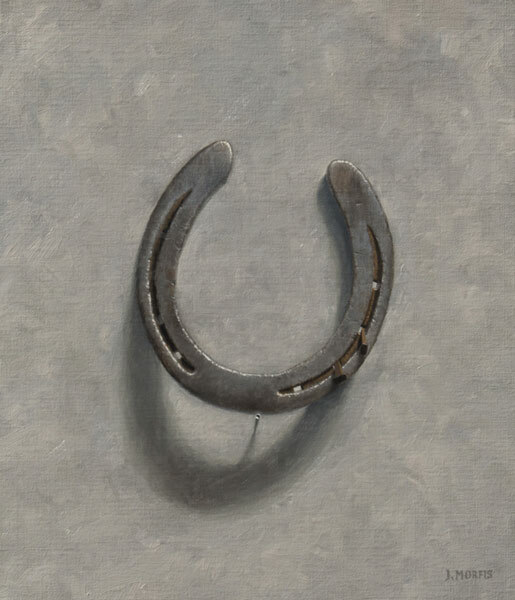 Just as in the last horseshoe painting, I resorted to a very neutral palette of colors which in my world of painting means mostly earth tones, white, black, and some grays. 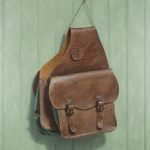 I have really come to like Gamblin’s portland gray series of paints although I do think that they lean ever so slightly towards the cool spectrum they have become a convenience I have grown to rely on. Like all painting situations, I just need to realize that that are slightly blue in nature and adjust accordingly. What do you think of this painting? Please leave a comment below. 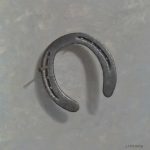 Love your horse shoes! Are they for sale? Thanks Rachel! Yes, my paintings are for sale…I’m sending you an email with some information.